Throughout each year, the Rochester Chapter recognizes fellow compatriots and citizens in Western New York for their service and dedication in the community. In addition to the awards listed below, the Rochester Chapter also distributes Eagle Scout Scholarships, Senior ROTC Awards, Junior ROTC Awards, Livingston Good Citizenship Awards and Alexander Millener Good Citizenship Awards to college and high school students for their excellence both in and out of the classroom. The certificate can be used by any SAR organization for recognition of service by members, speakers, and for any other persons that may provide services and support to the SAR. This medal is to recognize outstanding personal service within the chapter. This certificate is to recognize outstanding personal service exemplifying the finest American ideals. It may be awarded on the national, district, state society or chapter levels. The National Society, a state society or a chapter may present the Emergency Medical Services Commendation Medal, first authorized in 2005, to an individual for accomplishments and/or outstanding contribution in an area of emergency medical services. The National Society, a state society or a chapter may present the Fire Safety Commendation Medal to an individual for accomplishments and/or outstanding contributions in an area of fire safety and service. 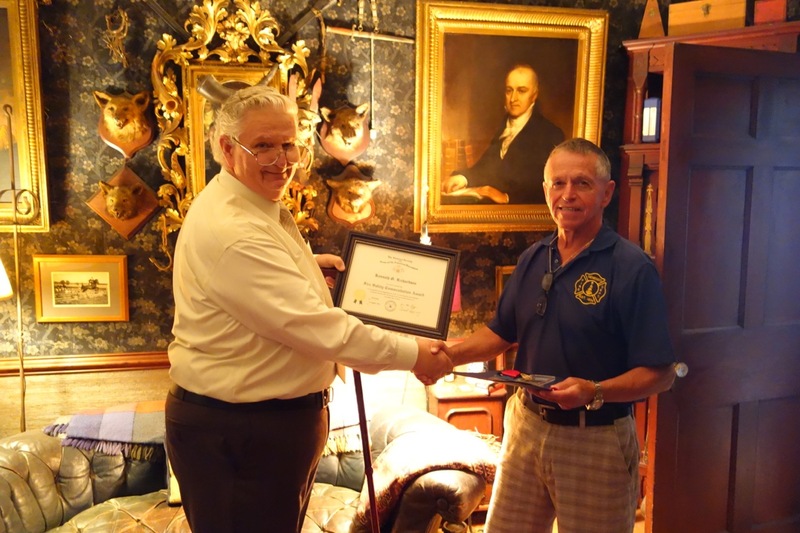 The National Society presents the Lafayette Volunteer Service Award to an individual for volunteer service performed at the NSSAR Headquarters in Louisville, KY or other significant volunteer work as determined by the President General. The award is presented when forty (40) hours of volunteer service have been accumulated. The National Society, a state society or a chapter may present the Law Enforcement Commendation Medal to those who have served with distinction and devotion in the field of law enforcement. The Liberty Medal, authorized in 1987, commemorates the restoration of the Statue of Liberty, reminds us of our liberty and is presented for recruiting new members to the SAR. The purpose of this medal is to recognize the Lady that the Society President determines to have been the most helpful to him during his tenure in the progressive line. The particular lady must have been involved for a minimum of 3 years. The National Society, a state society, or a chapter may give the Martha Washington Medal, authorized in 1971, to a woman over 18 years of age in recognition of outstanding service to SAR. The National Society, a state society or a chapter, may present the SAR Medal of Appreciation, authorized in 1960, to a member of the DAR in good standing in recognition of and in appreciation for outstanding services rendered to the SAR. The Member Emeritus Ceritificate is earned for 50+ years of continuous membership. The Meritorious Service Medal, authorized in 1980, may be awarded to SAR members who have rendered long, faithful and meritorious service to their chapter, state society, district, or to the National Society. The Military Service Medal is presented to those men who served in any branch of the US armed forces, but not during a period of declared hostilities. The Patriot Medal is awarded only by a state society. It is the highest award given for service at the state or chapter level. This medal is presented only to individuals and may be received ONLY once. It represents long, faithful and outstanding service at the state and/or chapter level. Service at the national level cannot be considered in making the award. The Robert E. Burt Award for Service to Boy Scouting is an honor presented jointly by the NSSAR and the BSA at the national level and requires local and state level approval by both the SAR and the BSA prior to submission to the Awards Committee. The Robert Sherman medal may be awarded to a SAR member who has rendered faithful service to their chapter, state society or to the National society over multiple years. other professions, and other fields of endeavor. Both of these recipients had their medals presented to Members of Congress! The Silver Good Citizenship Medal, authorized in 1939, recognizes outstanding and unusual patriotic achievement and service that is of a more local degree (state or regional level) than required for the Gold Good Citizenship Medal. The Bronze Good Citizenship Medal, authorized in 1895, recognizes persons whose achievements are noteworthy in their school, community or state. States or in a United Nations Peace Keeping Force) and fought against a common enemy of the United States in a war or action that has been recognized by a branch of the Armed Forces of the United States and for which a campaign medal and ribbon are authorized.